This website made possible in part by Collins Vacation Rentals, Inc. 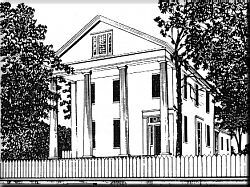 The story of the Raney house is interwoven with the lives of the Raney family and the booming cotton port of Apalachicola in the early 1800's. When David Greenway Raney and his bride, Harriet Jordan, who were both Virginians, arrived in the little city of 2,000 in 1834, the large plantations of Georgia and Alabama were sending their cotton down the river to be loaded onto the great sailing vessels anchored off St. George Island. The up-river cities and plantations in turn received manufactured goods from this port city. David Raney purchased waterfront property and established a prosperous commission company. His columned home on Market Street was completed in 1838. Raney was always involved in community affairs, both political and social He served two terms as mayor and during his time in office the city's first ordinances were enacted. He was also a promoter of the city's short-lived race track, and he encouraged traveling theatrical companies by providing a theater. Six of the couple's nine children lived to maturity. Three sons served in the Confederate forces, David G. Jr. as a marine officer, Edward in the cavalry, and George P. in the infantry. The Haney parents and three young daughters moved to Bainbridge, Georgia, during the war. The closed house was broken into and vandalized when Yankee troops took the town. It would have been burned if the wind had not been blowing toward a collaborator's house next door. In 1868 after completing law school, George Yettus Raney, the youngest son, was elected to the State Iegislature. In those Reconstruction days, young Raney was minority leader in the house. He served under two governors as Attorney General and in 1888 became Chief Justice of the State Supreme Court, and later he continued with a distinguished law career. The old home was willed to two daughters, Mary Raney and Virginia Raney Porter, when David Raney died in 1881, aged 82. The mother, Harriet, and Frances the eldest daughter had died earlier. In the following years Miss Mary Raney stayed in the home and reared her deceased sister's son, Will Oven. In 1914 the sisters sold the house to Dr. J. S. Murrow who built an office on the north side. On retirement in 1939 the doctor sold the house to Irene Tucker who ran a boarding house there until her death. The City of Apalachicola purchased the place in 1973 and received federal funding for its restoration. The Raney house was placed on the National Register of Historic homes in 1972.